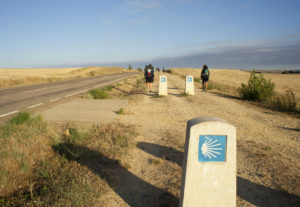 The Camino, or “The Way,” across Northern Spain to the Cathedral and burial spot of Santiago or Saint James in Northwestern Spain has almost a 1000 year tradition in the Catholic/Christian faith. As a walking pilgrimage it is a graceful and joyful journey. Making it with friends or with a community of companions in faith makes the pilgrimage even more enjoyable and fruitful. « St. Jacob Lutheran Church Returns from Europe!